If you have a small space to work with, you might not fancy a full-on pine-needle-dropping real Christmas tree. Also, real trees are impractical if you don’t have a car to get them home with. The fake ones can look quite tacky as well, and neither option is the absolute best from an environmental perspective. I’ve seen lots of people get round the Christmas tree conundrum by making creative pictorial, wall-based trees that are great for small spaces. Also, painted branches are a popular and easy-to-make solution. Here’s the low down on the best ways to make an alternative Christmas tree. Mini Tabletop Tree. If you want the real tree experience but are stuck for space, just get a Christmas tree “top” and use it as a tabletop tree. Abstract Wall Tree. Make a tree shape on the wall or a big mirror, using paints and collage. Ideas to build on this include using tape to make the Christmas tree, or using multi-colored post-it notes, maybe in fluorescent or pastel. Or why not use beads, doilies, family photos, or actual Christmas tree baubles? Blackboard Christmas Tree. Paint a blackboard on the wall (with blackboard paint) and use chalks to draw an infinitely renewable Christmas tree. Painted Twigs or Branches. Depending on your available space and motivation levels you can either pick up a single branch or go to town with a whole network of twigs and branches. Paint them white, spray them silver, or go for another colour, and adorn with traditional Christmas baubles. If you’ve a lovely gnarly twig like the ones pictured here, just leave it natural for a stunning effect. Christmas Card Tree. As your cards arrive, simply stick them to the wall, creating a tree shape as you go. Christmas Tree Shrub. Decorate a garden shrub like a tree, then you have a plant you can keep in the garden after the festive season is over. Christmas Tree Cakes. 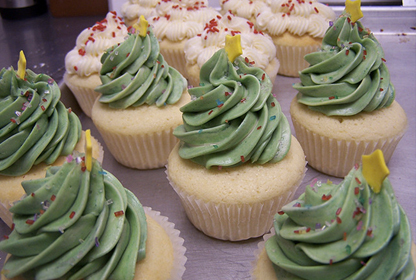 Decorate cup cakes with peaked green icing for an edible festive treat. Use cake decorations and pipeable icing to look like baubles and tinsel. Buy a Reusable Tree. I’m not talking fake plastic pines; there are a number of reusable designer trees on the market that work well in small spaces, and some are made from recycled materials. Take a look here for inspiration. Buy a Wall Decal. This is a quick, easy and economical way of making a space-saving tree, and many of these decals are reusable year after year. Take a look here for some ideas.